Don’t do a Google image search for “ring avulsion.” I’m not kidding...don’t do it. Just trust me that when a metal ring gets caught on something, and your body weight pulls in the opposite direction, things get grisly pretty quickly. Just ask Jimmy Fallon. You’ve probably heard of silicone wedding bands, which snap under pressure rather than destroying your finger, and Enso sent me one of theirs to check out. Rings from the Elements collection are infused with the actual metal they’re trying to emulate, and for a piece of silicone, they do have some shine to them, at least in the right light. The Enso Elements collection incorporates real metal into the silicone to give it a little sheen. It’s not going to fool anyone, but it does shine under direct light. In dim light though, it’s very clear that the ring is made of rubber. That said, they’re not going to fool anyone who’s looking closely, and Enso seems to understand that, offering a variety of designs that lean into the flexible, moldable nature of silicone. After trying the ring that most closely resembled my own simple, gold wedding band, I think the next one I buy would be something completely different like the textured Infinity line ($25), or the minimal Ultralite ($10), both of which come in a variety of colors. There are even clearance rings that start at $6, for the curious. Of course, the simplest solution to protecting your finger from ring avulsion is to just not wear a ring in risky situations (though it can happen at any time, again, ask Jimmy Fallon). 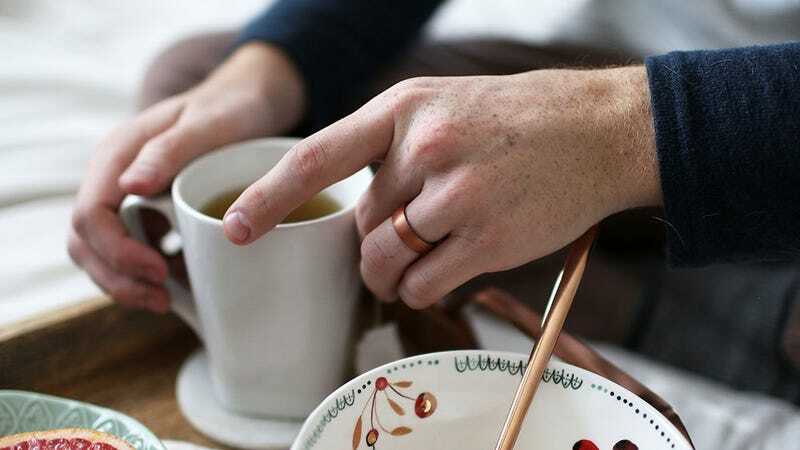 But if you prefer to always have a wedding band on your finger, Enso probably has an option that you’ll like.